Last week my mama and I headed out for a night of fall festivities at our local Williams Sonoma store. They were having an open house and called to let me know I could receive 10% off for attending, on top of my 10% off for registering with them. Count me in! Besides purchasing some things I still needed from my registery, I also fell in love with this simple autumn gravy boat. I know this little tureen will be a fixture at our Thanksgiving table for years to come (yes, mom, I'll bring it to your house this year : ) even though we don't host Thanksgivings quite yet. I want it to be something I pass on to my children. 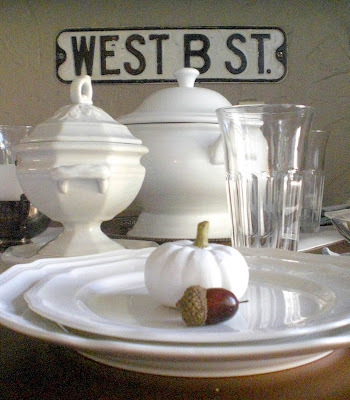 Since we aren't hosting a holiday dinner I thought I would do a quick little Thanksgiving tablescape, just to give the gravy boat a proper test run. Do you have any traditions for Thanksgiving? I'll need some ideas to begin with our own little fam. Please share! PS- a bit of housekeeping. I love to respond to your sweet comments! My favorite way is via email, so I can simply reply back to you. However, if you don't have your email address "visible" in your google account, all it says is "no-reply" and I can't respond to you : ( I will do my best to answer in the comment section, but if you'd like to to turn on your email, just go in to edit your profile and check the little box that says "show my email." I bet this would help a lot of bloggers answer your kind comments, which in my opinion is one of the best parts of blogging : ) Many thanks in advance! I'm linking to Farmhouse Fridays at Laurie Anna's. WOW! Your tablescape is simply stunning. 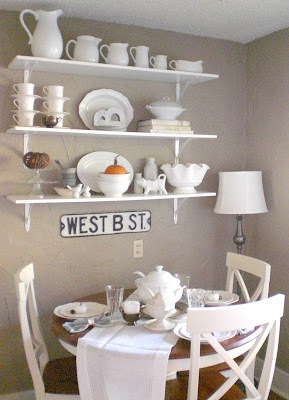 I love the white dishes, white pumpkins, the white shelves.....oh I could go on forver! It's gorgeous! 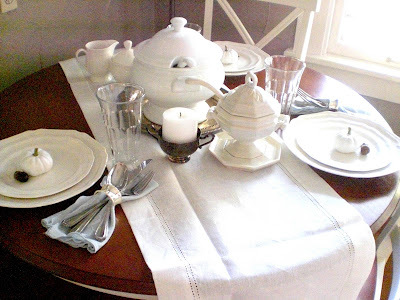 I love your white tablesetting! 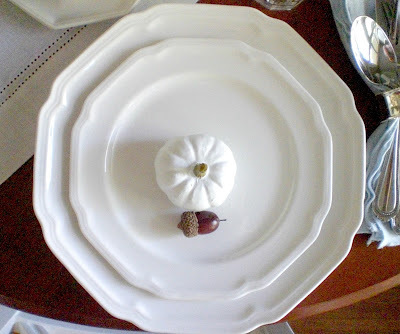 I am a big fan of white dishes anyway. I'm not hosting Thanksgiving this year either, so I guess my dishes will just stay in the cabinet. I'm dropping by from Farmhouse Friday. 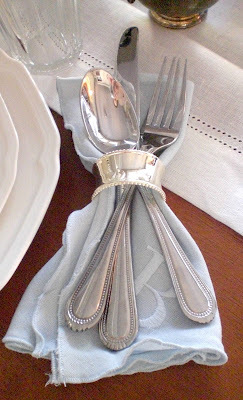 Such beautiful table styling! Right down to the little acorn. I can't seem to stay out of WS lately. Such a wonderful tradition you are beginning! Your dishes are beautiful and the tablescape is charming. 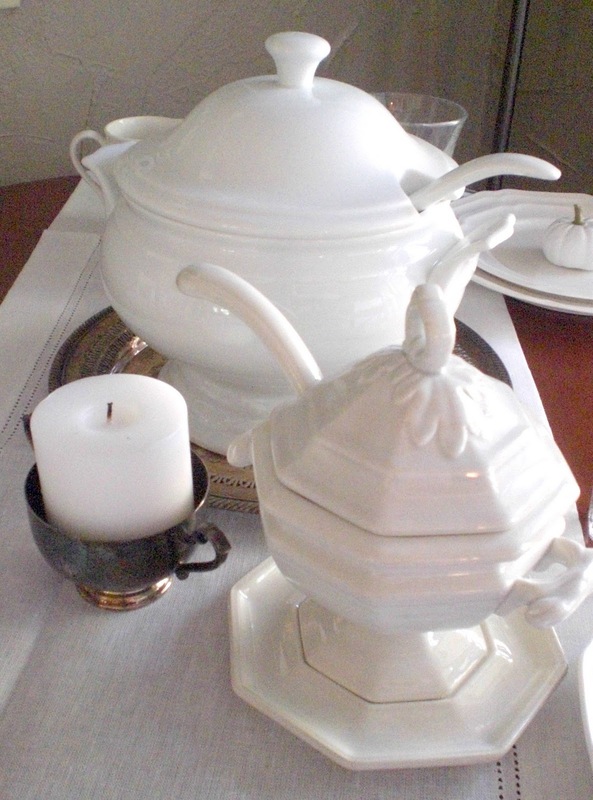 When I was a younger married woman, I received a white ironstone soup tureen as a birthday gift. The top of the tureen is a hen. She is beautiful and still perfect for every occasion after all these years. That sounded like I wasn't married anymore....I AM...32 years to my first crush! White dishes are so beautiful, and classic. 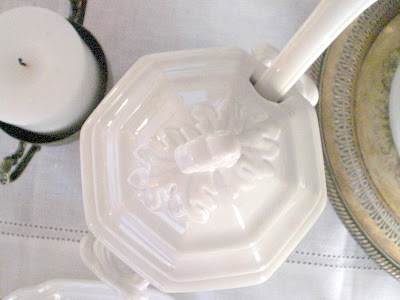 The detailing on the soup tureen makes it very special. I featured your blog at stylesson today. I have a strange fasination with gravy boats, so of course I'm a loving your need one. It's beautiful. We do have a few traditions for the holidays. That is part of what is so fun about starting your own home. :) This is a beautiful table. I loved that evening with you, my dear! 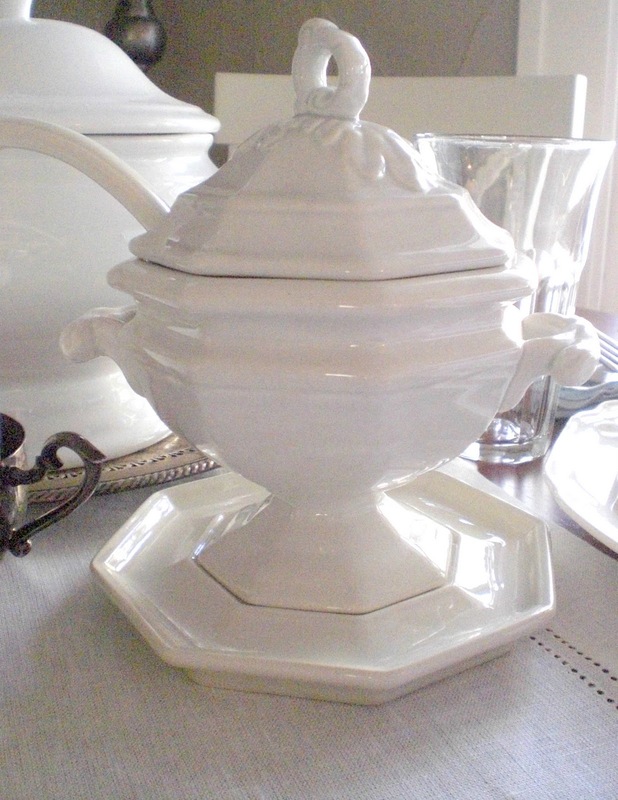 Can't wait to "borrow" the gravy boat for Thanksgiving this year (& maybe we need the tureen too???). Your table looks incredible! Wish we could all fit in at your place, but you can help me make mine beautimous as well! Muito bonito. Parabéns pelo bom gosto.